Revolution 21's Blog for the People: It's Viva-tonal! This might be the cleanest-sounding 1928 record you've ever heard. One quick takeaway from that happy accident -- 1928 recording technology was a lot better than you'd think it was, particularly the quality of the microphones. It's a strange experience to come across a batch of 80- and 90-something-year-old 78s, as I did last Friday at an estate sale, and have them play almost as they did in the 1920s and early 1930s -- only on modern equipment and not wind-up acoustic gramophones. THIS IS one of those records, Lee Morse and Her Blue Grass Boys with "Shadows on the Wall." 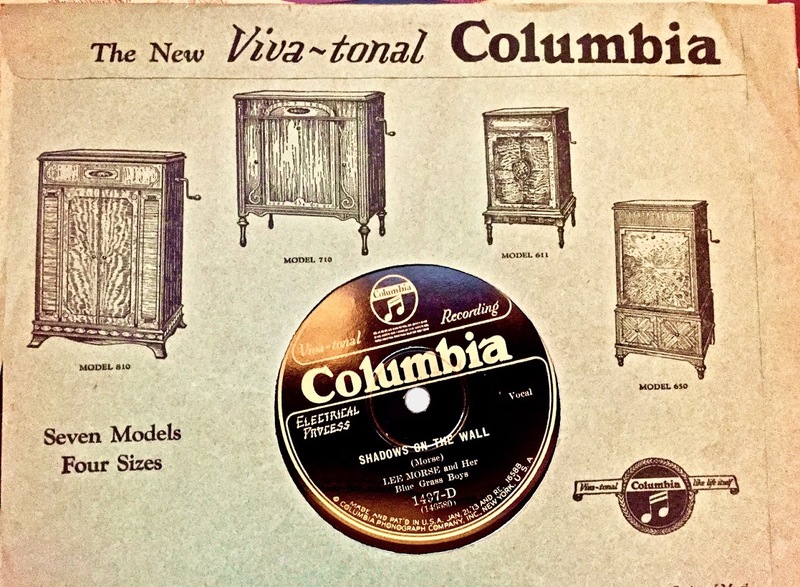 It's one of the earliest Columbia electrical recordings, which the label branded "Viva-tonal." Simply put, an electrical recording is just that: It is recorded using microphones and amplifiers feeding an electrical signal to a cutting head. Earlier "acoustical" recordings were all-mechanical -- performers played into a large horn, which moved a cutting stylus with sheer air pressure from the sound waves. That was the reverse of the playback on an old phonograph with a large horn that amplified the vibrations from the needle moving through the record grooves. In other words, it was . . . Viva-tonal. Indeed.